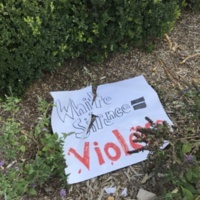 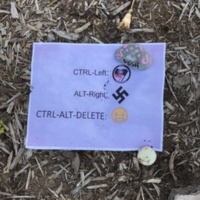 Items contributed through the "Unite the Right" Rally and Community Response form. 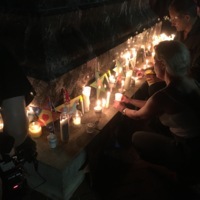 Candles and other items left on TJ side of Rotunda after the Candlelight march on the Lawn. 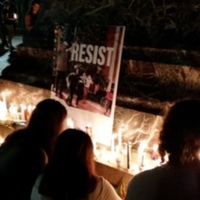 Candles placed on the Jefferson Statue by attendees, including Ellen Catz Ramsey, librarian at UVA, during August 16 "Take Back the Lawn" march. 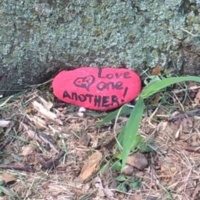 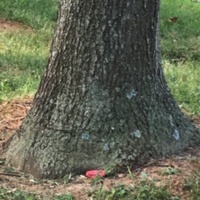 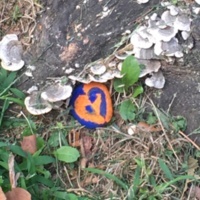 Painted stones left under trees along University Avenue sidewalk by Nameless Field the morning after Take Back the Lawn march. 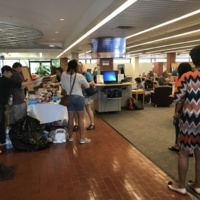 After the state of emergency was declared by the governor, a potluck lunch organized by medical students as part of the day of reflection was moved indoors to Clemons Library.